Macroblade 110 3WD W is one of the fastest skates with superior lateral support to release one's inner racer. This skate is a great bridge product between the race and recreational skate worlds. It has optimal support, speed, comfort and stability. 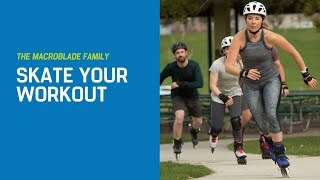 High end components, 3WD frames, knit uppers and a very secure closure system with speed lacing make this a stylish, great choice for someone serious about skating but does not want a lower profile race boot. Brake is in the box.